Bangladesh is a developing country. Its economy is on the process of rapid developing. A large portion of its economic earnings comes from agricultural sector. Many farmers have chosen to produce a large quantity of mango fruit and rice cultivating, as they know by doing this they have a great chance to succeed. Because not only they can sell it in their own country but also they have a great possibility to export as mango and rice has great demand outside the country. Mango is a fruit widely cultivated in the tropical and subtropical countries of the world. This favors Bangladesh for mango cultivation. The name mango, by which the fruit is known in English and Spanish speaking countries, is derived from the tamil man-key or man-gay. Local varieties, raised by seedlings, popularly known as “deshhi” or “guti am”. The latter has no recognized varietals names, and the taste is not assured. Bangladesh produces a large number of superior varieties of mangoes, mostly grown in Rajshahi, Nawabganj, and Dinajpur. These have wide demand in the market and commercially important. Prominent among the elite varieties are fazlee, langda, gopalbhog, himsagar, khirsapat, ashhwina, khisanbhog, kuapahadi, lata bombai, foria, bombai, kohitoor, laksmanbhog, mohanbhog, misribhog etc. There are nearly 100 cultivars of mango available in Bangladesh. Although there are numerous orchards scattered all over the greater Rajshahi and Dinajpur districts, and other areas of the country, most of these are not well organized, old and therefore non productive. So, I want to try this out as a businessman. Again, rice is an important sub sector of agriculture in Bangladesh and plays a very significant role in nutrition, employment, foreign exchange earnings, and food supply. Rice grows in hot & moist climate.Heavy rainfall is necessary for its good growth.Rice grows mainly in Bangladesh,India,Burma,China,Japan & pakistan.In Bangladesh Sylhet,Rajshahi, Mymensingh,Rangpur,Dinajpur & Barisal is famous for rice. In Bangladesh there are three main types of rice: Aus,Amon & Boro.There is another kind of rice called IRRI.Aman paddy is the best in quality.Now IRRI is cultivated all the year round.Rice grows at the top of a weak stick like stem. I also have this business in my consideration. As a student of B.B.A. our every thought and thinking is business related and should be so. We have options of doing our own business or work as an employee. Most person well favors option one. To do a business a business man must choose a suitable business for his or herself, which will be legitimate, have sustainability, have a good impact on socio-economy and most importantly bring profit for the owner. This assignment helps me to choose a business from the two projects (mango production and rice cultivation). Here I have calculated NPV (net present value) of the both projects that helps me to determine the present value of the return. I have also calculated PI (profitability index) that is the return amount at the cost of one taka. PI calculation helps me to choose a project, which has more potentiality of being successful means that will bring me more return at one taka invest or cost. Be calculating this it will be easier to me to select a project. This way of choosing will be more rational and scientific. In this assignment I have done project forecasting. Forecasting is very important for any business doesn’t depend on what is the nature of the business, size of the business, forecasting is must for any business. So, this attempt of forecasting will increase our experience, and gather more knowledge, and learn the unknowing ones. Sometimes choosing between to project may get difficult, in that case to choose the better one the character of the owner has to be bold and strong. In this assignment I have make a choice between two projects that helped me to get stronger in decision making. Bangladesh is a tropical country. Its climate is suitable for production of mango and rice.As these are accepted as one of the main earning products of Bangladesh lots of attempts are going on all around Bangladesh to increase the production of these items. Although before today rice and mango production was going on, may not be in a great quantity. Over the last decade or so it increased in a great deal. As it proved a potential sector of Bangladesh a lot of investment is going on over rice and mango production. This investment includes labor, money, and area. This table shows us how important these sectors are for Bangladesh. As a lot of peoples are working in these sectors and lots of money is invested, it can be said that rice and mango production are very meaningful for Bangladesh. Bangladesh produced about 1,86,760 m tons of mango during 1997-98 from an area of about 1,24,520 acres. The annual production, however, fluctuates, depending upon various factors. The present production is not very high compared to that of other mango growing countries. According to FAO, mango production in this country amounted to, on average, about 4,24,000 m tons during 1969-71. This indicates that the production has declined considerably during the last three decades. The factors that are considered responsible for the decline of production include: (1) old trees which are no longer productive; (2) a general lack of interest and attention amongst owners; (3) lack of management and care of trees; (4) absence of plant protection measures against insect pests and diseases; (5) growing trees from seedlings; (6) apathy towards use of improved techniques of production; and (7) indiscriminate felling of productive trees for fuel wood, road construction, house-building; (8) attack of insects etc. Rice is the most important food crop grown in the world. It is the most extensively grown. Rice is an annual crop plant, growing about 3-5 feet tall, and sometimes even taller. The origin of the word rice comes from the Tamil word arisi. Rice is a semi-aquatic crop. Rice belongs to the family of the genus Oryzae. Rice can be grown anywhere between sea level to an altitude of 1000 feet above the sea level. The climatic conditions for rice are between 21 C to 35 C.Rice (dhan) a cereal food plant, Oryza sativa, of the grass family Gramineae, extensively cultivated in warm climates, especially in East Asia, producing seeds that are cooked and used as food. Rice is cultivated in Bangladesh throughout the year as Aush, Aman or Boro. Aman (broadcast and transplanted) is generally cultivated in December-January, Boro in March-May and Aus in July-August cropping seasons. 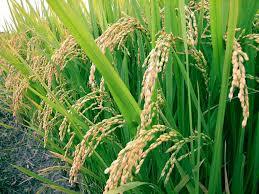 Among these croppings transplanted Aman is most important and occupies about 46.30% of the rice cultivated land. The rest 26.85, 17.59 and 9.26 percent of the land is occupied by Boro, Aus and sown Aman respectively. Transplanted Aman is grown throughout Bangladesh and sown or broadcast Aman is grown mostly in the south and southeastern part of the country. Aus is cultivated scatteredly in most of the districts. About 40 percent of the world’s population derives most of their calories from rice. Almost 90 percent of the population of Bangladesh, Myanmar, Sri Lanka, Vietnam and Kampuchea are rice eaters. Rice has about 23 species whereas only two are know for their commercial purposes. The two species are Oryzae sativa (Asian rice) and Oryzae glaberrima (African rice). The former specie is believed to be the most commonly grown species in the world. All the cultivated varieties of rice suffer from several diseases. Of these, viral, bacterial, fungal, and nematode-borne diseases are mostly prevalent between June and December. 1 Virus and Mycoplasma diseases- Tungro was first recorded in Bangladesh in 1966, and is reported as the most damaging viral disease of Bangladesh. 2 Yellow dwarf is a minor disease in Bangladesh. Symptomatically, the leaves, particularly the young and newly emerged ones show general yellowing which follows severe stunting, production of fewer panicles and chaffy grains. 3 Bacterial diseases- Bacterial blight/Bacterial leaf blight In Bangladesh the disease was first noticed in 1966. The disease is caused by a rod shaped gram-negative bacteria, Xanthomonas campestris pv oryzae. 4 Other diseses are Bacterial leaf strea, Fungal diseases, Sheath bligh, Brown spot disease, dak pora’ or ‘thore morah’ rown spot disease, also known as ‘sesame spot. Keeping harvested paddy or threshed, dried rice in appropriate places, bins, warehouse or containers for future use and also to prevent deterioration of quality of the grain. The purposes of rice storage are: to provide constant supply of food grain throughout year; to retain viability of the grain for planting in the following season; to take advantages of higher prices offered by traders; and to serve as reserve during times of food scarcity. Stored rice appears to be more relished and hence conventionally some consumers prefer to store rice for a certain period. Rice storage is therefore carried out by the producer, the trader, the processor, the government and the consumer. Rice grain is generally stored from one harvest season to the next for a maximum of one year. However, crop surpluses or government policies might require that the grain be stored for extended periods. Storage systems Like all other food grains, rice is stored principally by two methods. Traditional storage Most rice grains produced in the country are stored in traditional storage structures at farmers’ level; these account for 70-80% of the total produce. Rice is interwoven with Bangali culture. It is the symbol of wealth. The Food Department of the Government of Bangladesh recommends 410 gms of rice/head/day. In 1997-98, Bangladesh produced about 19 million metric tons of rice. This was 15% less than the need. Table shows the statistics of rice production in Bangladesh during 1997-98. Aman tops the position, followed by Boro and Aus, irrespective of area and production. Though covering 55.65% of total area, high yielding varieties (HYV) produced 73.59% of total yield. From a minor position, Boro has stepped up to the second place. In 1995-96 agricultural GDP was 30% (at current price), and crop sector had an 18% share. Rice alone-shared 13% of agriculture and 72% of the crop sector’s GDP. Rice covers about 70 percent of the total annual cropped area. It is grown throughout the year and provides employment for 75 percent of the total labour force in the rural areas of Bangladesh. * Rice consumption depends on two factors – population and income. Let’s take for example Asia. Rice is the staple food of Asia. Low-income groups consume more rice according to the per capita income increase. But as the income increases, there arrives a point when the consumption starts to dip. Income growth and reduction in population result in a low consumption of rice. Profit earning is the main aim of any business. Every business keeps an eye on profit and then conducts their activities. Net Present Value (NPV): The NPV equals the present value of each cash inflow, minus the present value of cash outflow with the cost of capital, used as a discount rate. Net present value is determinedby calculating present value of probable earnings of the future and then from it the cost is to be minus. Profitability Index (PI): Profitability index identifies the relationship of investment to payoff of a proposed project. It is also known as Profit Investment Ratio, abbreviated to P.I. and Value Investment Ratio (V.I.R.). Profitability index is a good tool for ranking projects because it allows you to clearly identify the amount of value created per unit of investment. PI is calculated by dividing present value with cost. If PI>1 project will be accepted. But if PI<1 project will be rejected. Here I am showing the starting costs consists of 40 acres of land the probable sector of cost may be labor cost, fertilizer cost, fencing cost, rent of the mango-grove, maintenance cost, transportation cost, packaging cost, cleaning cost, electricity bill, miscellaneous cost. The production rate that is 2.00 metric ton per acre (average) it is assumed that in my 40 acres land by investing our full efficiency and modern technology we can produce 80 metric ton at least. If I sale 1 K.g. at 16 taka at wholesale rate I can sale up to 12,80,000 taka at first year. if I follow production increase rate is 0.35% per year we can produce 41.5Mons more in 2nd year averagely where our sale may rise up to 12,97,928 taka. The production rate that is 1.5 metric ton per acre (average) it is assumed that in my 50 acres mango-grove by investing our full efficiency and modern technology we can produce 75 metric ton at least. If I decide to sale 1 kilo at 20 taka at wholesale rate I can sale up to 1500000 taka at first year. Again if I follow production increase rate that is 0.53% per year we can produce 397.5 kilo more in 2nd year where our sale may rise up to 1507960 taka. PI of the project is 1.51 taka. So, PI of the project is 2.22 taka. NPV of the project 1 is 36,16,640 taka and NPV of mango project is 25,60,480 taka. Again PI of the rice project is 2.22 taka and PI of the mango project is 1.51 taka. Between the two projects, project rice is distinctly ahead than the project mango. I choose the project rice that is mango production as my business. Mango is a sub and Rice is one of the main agricultural sectors. This can earn a lot of foreign money after satisfying the inside needs of the country. Bangladesh has a major unemployment problem. By making business of these agricultural products unemployment problem could be reduced. And as these businesses rarely give a negative result, any one can try this out by having the determination and willingness to hard work. Rice production in Bangladesh is extremely important to the economy. The mango is one of the most delicious fruits of the world and is rightly designated as the ‘king of fruits’. Different varieties however, have different tastes and flavors. The best consumption of mango is in the form of fresh fruit. As the earning ratio is good for the mango production, there should be more operations to make it better. The calculation of the projects shows that Rice Production has more ability to be successful. But by taking some measurement it could be more profitable. So, trying of this should not be stopped and should think about seasonal Mango fruits production. To increase the production some steps could be taken. Some steps are stated below. 7 Government should take necessary steps .